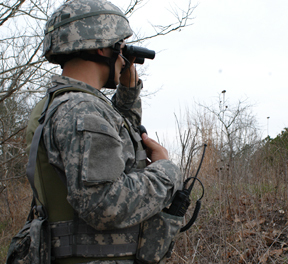 Most warriors understand reconnaissance – the need for it, it’s objectives, and how to conduct various reconnaissance techniques. Yet when tasked with an Intelligence Surveillance Reconnaissance (ISR) asset, few small unit leaders are comfortable with this asset. In fact, it is commonly viewed as a burden. And so now it’s time for a lengthy lecture on reconnaissance. Blah, blah, blah. Yeah? We’ve all been lectured to sleep over ISR assets. It’s boring. I agree. Let’s not do that. Instead, let’s take a look at reconnaissance through the eyes of the small unit leader in the nature of The Defence of Duffer’s Drift (1904). I’ll remind you that the young Lieutenant N. Backsight Forethought, the pseudonym for MG Sir Ernest Dunlop Swinton, engages in multiple dream sequences. After each dream’s failed mission, LT BF magically forgets the particulars of the dream, but does recall each lesson learned. So it is that LT BF and his platoon are tasked with a patrol through enemy territory, and upon this task they are attached a small recon team. Being a burden and not having fit within his original mission order, our lieutenant refuses to deploy the recon team forward, or does so haphazardly and the rest of the story is fairly predictable. The platoon and/or the recon team run into a formidable enemy position, perhaps an ambush. There are many casualties for our warriors and the platoon turns back, failing to achieve its objective. Rule #1. Employ reconnaissance teams and assign them specific objectives. This may involve “reconnaissance push” whereby there are areas of interest such as natural choke points in the terrain or unknown populations of people that require some investigation before being approached. The patrol leader simply identifies these areas of interests and gives the recon team some basic guidance on what he needs to know. Or, this may involve “reconnaissance pull” in which the recon team moves forward with guidance from the patrol leader regarding targets the patrol is seeking, or intends to avoid. When the recon team identifies such targets, the recon team pulls the rest of the platoon toward or away from these enemy threats. Once again our platoon is tasked with a patrol through enemy territory. LT BF will be heading down the exact same route, not remembering much of the previous night’s dream. However our lieutenant does recall Rule #1 and so when he is assigned a recon team, he gladly includes them into the mission. However, taking note of the team’s small size, LT BF enhances their firepower and even assigns a supporting weapon crew to the recon team. They are given the particulars of a named area of interest and dispatched. Some time later, a firefight erupts forward of the lumbering platoon. LT BF is on the radio trying to get the recon team to respond and develop the situation for him, but it is clear the recon team is decisively engaged in battle. They do not respond. Instead, they return an hour later to the stalled platoon. The recon team has taken casualties and appears fairly well mauled. They are exhausted, and the enemy has clearly taken note of the intention of the platoon to pass through the choke point. The LT wisely decides to turn the patrol around. Again, we’ve failed to achieve the mission. Rule #2. Reconnaissance teams maintain maneuver and avoid decisive engagements. When we task organize a recon team in the same manner as an offensive combat patrol, we invite the exact same outcome – a decisive engagement. The recon team may very well engage an enemy force with the intent to overwhelm and destroy the enemy. Yet this is an enormous mistake. When a warrior is engaged in a decisive battle, he cannot extract himself readily, easily or even safely from the battle until it is clear one side or the other has gained an upper hand. If the recon team engages in such activity, their mission to develop the situation as the “eyes and ears” of the patrol leader will take second priority to saving their own skin! Do not prepare a recon team for decisive engagement. They must maintain maneuver – the ability to break away from the enemy and regain contact to develop the situation for their commander. Remember that contact might be visual observation of the enemy force. It does not always mean a gunfight. Indeed, it is best if our recon team can visually observe the enemy without them aware of our presence. LT BF is back at it again, having no memory of the previous night’s dream except the lessons learned. Our mission takes us through treacherous enemy terrain. Fortunately, we have a recon team attached to our platoon. LT BF quickly incorporates the recon team into the mission order. They will serve as forward vanguards, having been given the particulars of a named area of interest. However, knowing that the recon team must retain freedom of maneuver, LT BF disarms the small team. He tells them to travel light, carrying only enough provisions and equipment to observe the enemy during their patrol. Halfway through the day, LT BF has been in constant contact with the recon team but progress is so frustratingly slow that it is clear we’ll never make it to our destination today. The platoon pulls into a patrol base for the night, and the recon team rejoins the platoon. The mission will have to wait another day. Rule #3. Reconnaissance teams gain and maintain contact with the enemy. Without force protection measures (i.e. 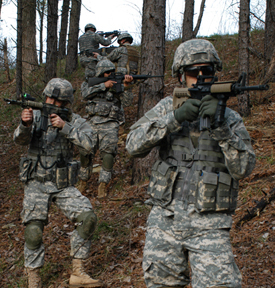 weapons), a recon team must default to stealthy reconnaissance. A stealthy approach avoids detection and uses concealment to surreptitiously sneak up on the enemy. This is time-consuming! By contrast, aggressive reconnaissance uses speed as a form of security. An aggressive approach employs direct and indirect fires, smoke screens, and maneuver to develop the situation. Mobility is the key. In either case, stealthy or aggressive reconnaissance, the objective is to gain and maintain contact with the enemy force. The situation must be developed. That is, the commander must understand quickly the disposition of the enemy force –their location or direction of movement, their numbers, their weapons and capabilities, their vulnerabilities, and so much more. All information loses value over time. It expires to various degrees. This is all the more true for an aggressive approach to reconnaissance because in most cases the enemy is very much aware that we have gained information about their disposition, and you can bet they will make changes as soon as it is feasible to do so. Often, in the case of a stealthy approach, the enemy is typically unaware that we have gained valuable information on their disposition. If we slip away unnoticed, that information has a longer shelf life, but ultimately all things change. So this information too will expire in time. Our platoon is tasked with a patrol through enemy country in order to link up with a Forward Operating Base. It is a daylong trip, if we get it right. A small recon team has been attached to our platoon. LT BF assigns the recon team to a named area of interest. After a short mission order, we are underway. Within the hour our recon team is engaged at a natural choke point. They have broken contact with the enemy and are maneuvering to the enemy flank. They inform LT BF that they have found an alternate route that will take our platoon to an adjacent hilltop on the enemy’s flank. In 20 minutes our platoon has linked up with the recon team, navigated the alternate route, and positioned ourselves on the flank of the enemy. We are exhausted due to the high altitudes, but we conduct an attack by fire immediately. Enemy troops begin to fall. The enemy wants no part of this and they break contact. LT BF has already reassigned and dispatched our recon team to seek out the enemy escape routes in the rear of their position. As the enemy pulls off the high ground, the recon team observes the enemy in an orderly retreat in a draw. On order by LT BF, the recon team engages the enemy at distance. Their accurate fires put the enemy into disarray. Our platoon is now moving quickly to link up again with the recon team. However, even before we achieve this, LT BF sees the enemy spread across the far ridgeline frantically fleeing in various small groups. It is clear they are no longer a threat to our patrol, and they are likely falling back on their reinforcements and supplies in the village beyond the ridgeline. LT BF senses culmination and recalls the recon team. We will not pursue the enemy. Our platoon is back on the route of movement. LT BF dispatches the recon team forward again with a new named area of interest to investigate. At this rate, we will make it to the Forward Operating Base before sundown. Rule #4. Leaders ensure continuous reconnaissance. The recon team is the eyes and ears of the patrol leader, the commander. When one objective has been developed or is no longer relevant to the mission, reassign the recon team to a new objective! Do not hold them in reserve. Yes, the recon team is adequately armed and equipped to defend itself, and in rare instance may engage the enemy. However, it will only do so for brief periods of time and at reasonably safe distances. Remember, the recon team must retain maneuver. There is no silver bullet to reconnaissance and ISR asset management. However, patrol leaders should wield these assets masterfully. Regrettably, seldom has that been the case. But with a little practice and adherence to these four simple rules, patrol leaders can master ISR assets.